But however you pronounce it, tomatoes are among American’s favorite garden vegetables. I adore them, myself. But only ones grown in the summer, in gardens, locally. Those tomato-shaped and vaguely tomato-scented things in the grocery store that are as hard as baseballs and vibrantly colored as as insipid and watery in flavor as they ever were, though it is true they have improved in looks over the past couple of decades. Here’s a recent harvest from our community garden plot. Above you can see four of the varieties we are growing. The green ones are ripe, though they are green inside and out–those are an open-pollinated variety called “Green Zebra.” Often considered an heirloom because it is open-pollinated, (which means you can save the seeds from one year to the next and they will breed true–when you plant them, you will get plants that bear the green and yellow, zesty fruit you had the year before) the Green Zebra was developed in 1983 by Tom Wagner in Everett, Washington. Characterized by a yellow and green striped skin and a kiwi-green interior, these small tomatoes are tangy and zesty in flavor with a good acid/sugar balance, and look beautiful sliced or cut into wedges in salads. “Green Zebra” is a prolific tomato that ripens earlier than many larger than cherry tomato-sized cultivars. My two plants are LOADED with fruit and I have to pick them every other day to avoid them over-ripening and rotting on the vine. I have to admit to trying the little red and orange striped tomatoes pictured with Green Zebra above because they’d look pretty on the plate together. This stripey variety is a new hybrid from Burpee called “Red Lightning,” and is meant to be an improvement on the heirloom, “Red Zebra.” I will say the vines are heavy with fruit, so heavy that they pulled my stakes down to the ground and broke them. I left them to clamber after that, feeling too tired to play with staking them all over again. These fruits ripen slower than Green Zebra, and the flavor is milder and sweeter. Overall–it is a pretty fruit, but not the tastiest I’ve ever eaten. I may try to grow it again in different soil and see if that improves the flavor–if it doesn’t, I won’t grow it again. The tiny orange-yellow cherry tomatoes are Kat’s favorites–the celebrated hybrid “Sungold.” This is one of the most prolific of cherry tomatoes I’ve ever grown, and it is hardy, tough, tolerant of container plantings, tolerant of too much rain (though if there is a lot of rain once fruiting commences, the tender skin of these tomatoes will crack easily) and mildew infestations, and will produce until finally done in by a good hard frost. As for the flavor of these little glowing gems–in the sunlight they look positively incandescent, and that’s saying a lot because I really dislike yellow as a color–they are sweet as candy. This, I suspect, is why Kat loves them so much. But it is a musky sweetness that isn’t just like eating tomato-flavored sugar–thus I like them, too. They are pretty as well; on the inside they sport a green gel around the seeds that contrasts with the golden flesh and skin. 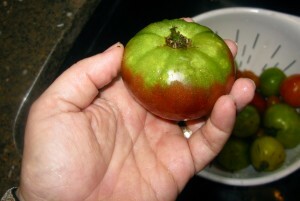 My favorite tomatoes that I grew this year, however, are the “Cherokee Purple.” These huge plants with stalks as big around as my thumb, are loaded with heavy beefsteak-style fruits that are burgundy red on the bottom, with contrasting green shoulders. 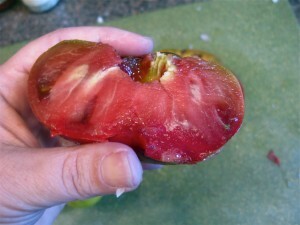 “Cherokee Purple” is my favorite heirloom variety of all (with Black Krim coming in at a close second)–the dark violet-red varieties all seem to have a deep, musky, rich flavor and scent that is out of this world delicious. Not too sweet, not too acidic, these tomatoes are delicious on their own, but they really shine when made into salsa or gazpacho, especially when mixed with other tomato varieties because they add a depth of flavor that is irresistibly seductive. Some people may find these purple and black types of tomatoes to be ugly–they do tend to have odd shapes and their colors are not what one expects if one is only used to red and every now and then, yellow tomatoes. I, however, find them to be not only tasty beyond belief, but beautiful, but then, I do have a rather unusual aesthetic sense when it comes to food. I like bright, bold color combinations in food, which goes along with my love for bright, bold flavors. I’m also growing the heirloom “Amish Paste” tomatoes in my plot, but mine have just now started ripening. Morganna’s however, are fruiting like there’s no tomorrow. 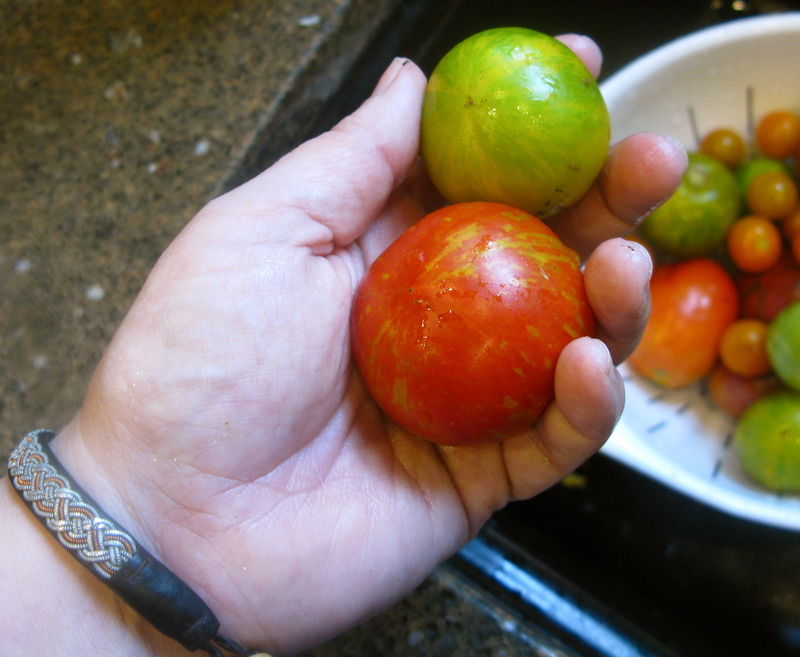 She declined to stake her tomato plants and so they are clambering all around the ground in a big tangle of vines–which I have to say is how my Grandpa grew his tomatoes, too–and they are vigorous and healthy with no sign of any mildew problems whatsoever. How do the growth rates and disease resistance compare between the heirloom, open pollinated varieties and the hybrids in our garden plots? One of the big advantages to growing hybrids is that many of them have been bred with disease resistance in mind–but truly–all of my tomatoes have succumbed to mildew problems due to a rainy two and a half months in the late spring and early summer. I say succumbed, but, really, it hasn’t slowed the growth of the plants or their fecundity. They are still growing huge stalks with lots of fresh green growth above the mildew-damaged branches and they are fruiting madly. And this is equally true for both the hybrid and the heirloom varieties–they all seem tough and hardy, and very resilient in the face of Colorado Potato Beetle infestations and damp conditions. So, for me, the jury is still out on whether hybrids are better growers than heirlooms. This means that I’ll continue to grow the varieties that I think taste the best and do the best in our garden conditions. Next year, I may also just let my tomatoes ramble about like Morganna has done, though I’m not as sure about that as I’d like to be. I have to note that slugs love tomatoes as much as we humans do, and I’ve seen at least three of her scarlet fruits eaten hollow by slugs who had no trouble getting to them as they were on the ground, as if waiting to be devoured by those slimy little devils. 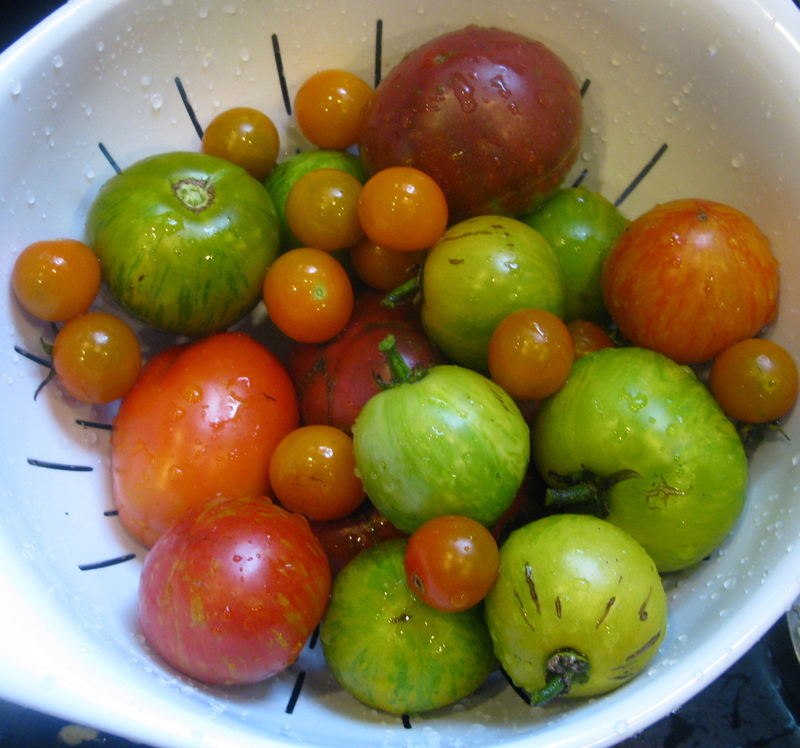 Now that I’ve had my say on tomatoes–what are your favorite varieties to grow and why? We have a slug problem, and given the chance they’d eat everything they could get their… whatevers… on. So mine are staked. I learned from my grandmother that tomatoes on the ground are very likely to rot? Not so, or only some varieties? Anyway, only one of my four varieties is heirloom – Pictsweet. They were the first non-cherry variety to produce, and look like they will continue gradually all summer, which is good. But they don’t taste like much, though that may partly be the fault of my soil. The best in my garden this year, not counting my prolific and tasty cherries, is the overpopular Big Boy. It’s not producing tons, but its flavor is much better than the Pictsweet or Better Boys. And it reminds me of my grandmother’s tomatoes, Big Boy being one of her favorites. That said, I may plant one Big Boy next year, but the rest will be less-vanilla varieties than I have now. Definitely a Cherokee Purple; beyond that, I’m perusing the Farmer’s Market to see what I might like. The one year I planted Cherokee Purple, it did nothing for me. I’m glad yours are producing! I also love Sungold. My favorite red varieties are Stupice (a Czech heirloom) and Crnkovic (a Yugoslavian heirloom.) I’ve been growing Stupice for years now, in several gardens, and they’ve never failed to provide me with plentiful harvests of medium-sized, delicious fruit. Crnkovic was a fortuitous experiment last year, which produced the most delicious large red tomatoes I’ve ever eaten. Very few made it into the house, because I kept eating them straight from the vine. I stake. I’ve let tomatoes ramble before, and not only do they produce less fruit, I get to harvest even less than that as they get invaded by slugs. Besides, it’s a more efficient use of space to go up rather than out. I’m growing Marvel Stripe and Druzba this year. My plants are heavy with fruit, but nothing has ripened yet (I have a very shady yard, so this is normal).